Role of hydroperoxide lyase in white-backed planthopper (Sogatella furcifera Horváth)-induced resistance to bacterial blight in rice, Oryza sativa L.
Kanno, H., and Fujita, Y. 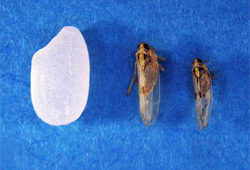 (2003) Induced systemic resistance to rice blast fungus in rice plants infested by white-backed planthopper. Entomol. Exp. Appl. 107, 155-158. Kanno, H., Satoh, M., Kimura, T., and Fujita, Y. (2005) Some aspects of induced resistance to rice blast fungus, Magnaporthe grisea, in rice plant infested by white-backed planthopper, Sogatella furcifera. Appl. Entomol. Zool. 40, 91-97.